Like so many English villages, Brockley is now little more than two rows of houses either side of a busy road, and yet you don't have to go far off that road to find yourself in another Brockley, rustic and utterly charming. Brockley would not be the first place you would mention if you were trying to list the names of every Suffolk village, and a quick straw poll of friends of mine in Ipswich, just 30 miles away, found nobody who had even heard of it. But I have always remembered it as a special place from my first visit some eight years before. I had come here on a beautiful summer day, the sun beating down and the fragrant heat rising from the graveyard. Coming back in 2008, I cycled up the lane towards the church with anticipation, and at that moment the sun came out, the clouds clearing from the wide Suffolk sky. Eight years ago I had hauled my bike across the field that separates the church from the lane. Now, there is a gravel path. It leads through a gate into a graveyard which is unusually narrow on the north side, but which melts into fields and woodland to the south. There is a fantastic collection of late 17th and 18th century headstones to the south of the church. Two old boys walking their dogs watched me photographing them, and then told me that they had skulls on them because they were from the Black Death. This seemed such a delightfully romantic notion that I didn't have the heart to disabuse them of it. Externally, St Andrew is pretty much all of a medieval piece, and a dedicatory inscription to the donor, Richard Coppynge, can be found at the base of the tower. Apart from the Victorian top, the tower is late 15th century, a little newer than the timber-framed porch. Through this, you step into a church which has been fairly rigorously Victorianised, but is still full of rustic charm and interest. A number of features survive from earlier incarnations. Most notable, perhaps, are the piscina drains set in window sills. These don't seem very exciting in cold print, but they are quite unusual, and they mark the places where altars were set during the church's Catholic days. They conjure up a vision of the former liturgical life of this building. You can imagine the chantry altars set within the nave, and priests concelebrating Mass at separate altars. All finished with now, of course. The lumpy colonaded font is older than just about any part of the churchbut not as old as the ironwork on the south door , which must be some of the oldest in East Anglia. The font sits proudly on its collanade beneath the tower arch, presumably moved there by the Victorians. The fine east window is also a Victorian reconstruction, but looks rather well, I think. It complements the early 20th century evangelists on the reredos below it. Beneath the tower is a lovely souvenir of the medieval bell clappers; they were replaced in 1992, and now sit proudly on a wooden memorial, the words our duty done in belfry high now voiceless tongues at rest we lie above them. A superb ogee-arched tomb recess sits in the south wall, and a most curious sight can be seen projecting westwards from high up on the east nave wall, each side of the chancel arch. They are corbels, and must have supported the rood beam, giving an indication of how high it was. A Victorian roodscreen was removed in 1986, and its wooden cross now hangs behind the pulpit. This is a lovely church, which few people will have heard of, and even fewer visited. 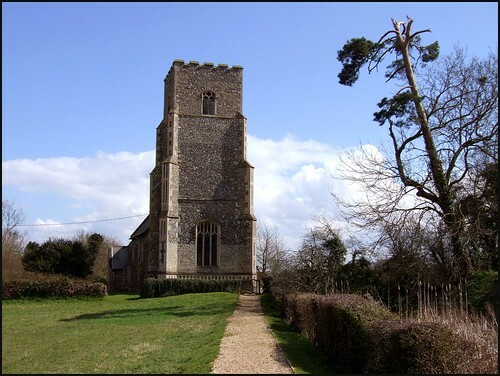 Suffolk has loads of churches like that, and every one of them is worth the time and energy.